We are proud to be a supporter of Alan Thoresen and the Black Thunder Team. Visual Plastics Limited manufactures and stocks an extensive range of over 380 models of premium acrylic motorcycle accessory windscreens and shields. Our fairing screens are now branded Godiva and have been designed to meet every need for street bike, touring bike or race bike. 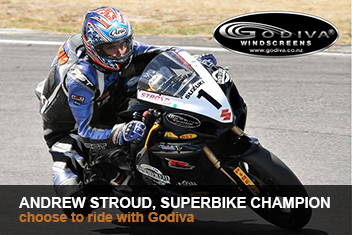 Godiva windshields come predrilled and have been easily fitted by thousands of satisfied riders worldwide. Whether restoring a classic bike, looking to customize a current model for dramatic appeal or needing to upgrade for a performance advantage, you can locate a screen or shield that is just right for you in our easy to navigate catalogue. We also supply custom bike screens with fast delivery nationwide.